Measured and planned growth will continue at Southern Illinois University Edwardsville, including the campuses in Alton and East St. Louis. The phones cannot be repaired because of outdated technology, according to Walker. • Founders Hall will be renovated, and the project will take place in two phases. In the first phase, the top two floors will be restored, and the classrooms and offices will be temporarily relocated to the Vadalabene Center and the Science East Building. Following a two-year renovation of the top floors, the bottom two floors will move into temporary quarters and be renovated. The first move is expected to take place in summer 2018. The entire renovation will take about four years to complete. • The skylights in the Morris University Center Goshen Lounge will be replaced in summer 2018. • The Disability Support Services offices are also targeted for renovation next summer. • The Alton campus will have many of its heating and air conditioning units replaced in the coming months. 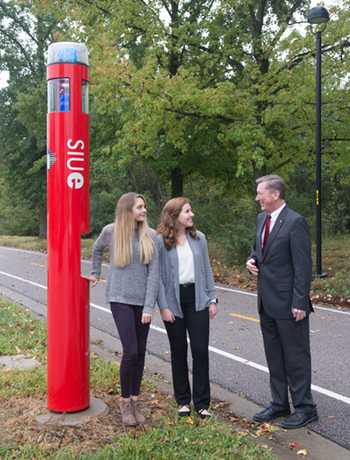 (L-R) Shown with SIUE’s new phones are Jessie Page, a junior majoring in nursing; Tessa Ackerland, a freshman majoring in business; and Vice Chancellor for Administration Rich Walker.